Call Boat Owner Reiddy 201-776-8705. Up for sale is a Rinker 206 Captiva. 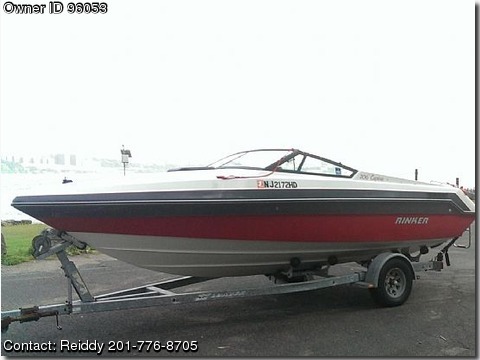 This is a great all around boat good for cruising ,tubing,water skiing . it has a mercruiser 5.7l 350ci 300hp motor less than 4hrs on motor ,alpha one stern drive ,new impeller,fresh fluid in drive , all gaskets and seals replaced, drive joints and bellows inspected excellent condition all hoses and boots in good order no cracks or rot , awesome boat lots of power super fun boat is ready to go for next season will winterize for you if you need it to be done . New exhaust manifolds,everything works nav lights ,bildge pump,fresh air blower,new horn,new batteries new jvc cd am fm stereo with marine cover,new speakers. interior is 9 out of 10 . only thing this boat needs is a new owner boat was test driven after new motor installed to ensure reliability about four hours on motor. boat has been tested with six adults gear and we were goin 45-50 no problem with strong current we were in boat for about 4 hours boat will easily do 60mph. cuddy is in mint condition also included is a bimini top dock cover.ez loader trailer included in sale. here are some videos of boat test run on hudson river if you would like more video please email me or text me tuneforlife@gmail.com here is a short video of boat cruising and wide open on hudson river with an approximate current of 8mph. if you wish any modifications can be added to boat at extra cost if you want led lighting wake board tower,side exit exhaust etc etc just let us know.